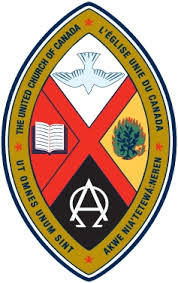 The church crest is the official signature of The United Church of Canada and visually presents the cornerstone of our faith and the traditions that shape us. As such, the crest displays our spiritual and historic roots. At the 41st General Council in August 2012, the United Church acknowledged the presence and spirituality of Aboriginal peoples in the church by revising the crest. Three churches joined together in 1925 to become the United Church. The open Bible represents the Congregational churches with their emphasis upon God’s truth that makes people free. The dove is emblematic of the Holy Spirit (Mark 1:10) whose transforming power has been a distinctive mark of Methodism. A symbol of Presbyterianism, the burning bush refers to the bush that burned and was not consumed (Exodus 3:2), and it signifies the indestructibility of the church. The oval shape echoes the outline of a fish, a symbol of identity adopted by early Christians because the initials of the words, “Jesus Christ, Song of God, Saviour,” spell the Greek word for fish. As the first letter of the Greek word for Christ, the “X” at the centre is a traditional symbol of the Saviour. The symbols alpha and omega in the lower quarter are the first and last letters of the Greek alphabet. They symbolize the eternal living God, in the fullness of creation (Revelation 1:8). The background colours of the quadrants of the crest incorporate the colours often associated with the Aboriginal Medicine Wheel, which reflects respect for diversity and interdependence. The four traditional colours of yellow, red, black, and white incorporate important teachings from the four directions, the four stages of life, and the four seasons. In the perimeter ribbon, the Latin words ut omnes unum sint mean “That all may be one.” Taken from John 17:21, they remind us that we are both a “united” and “uniting” church. The French translation of the United Church of Canada – “L’Eglise Unie du Canada” – was added by the 28th General Council in 1980. A phrase from Canada’s many Indigenous languages is the latest amendment: “Akwe Nia ‘Tetewa:neren* (“All my relations”). These Mohawk words share Aboriginal peoples’ understanding of Christ’s vision that encompasses all. Mohawk was chosen because the first documented ministry between Aboriginal peoples and the founding denominations began in 1822 between the Mohawks and Methodist missionaries. Through God’s grace, we are indeed a “united” and “uniting” church, and we live this out even in our crest. Thanks be to God.